I saw this card from Louise Hay (or @louise_hay_affirmations) and it resonated so loudly with me. “I allow others to be themselves”. Wow. I, immediately, thought of my relationship with my husband. And, it made me smile. I don’t know about you, but relationships are hard. They are a constant learning process. My husband and I have been together since 2001. You’d think we’d have this relationship thing nailed down years ago! But, he and I are cut from very similar cloth. Whomever was cutting that cloth might have even zig-zagged during the cutting process, because….wow! We feel the same things. But, at different times. We both have a Zodiac of Cancer. I’m not sure if that’s the reason, but the similarities are crazy. We took a personality test not long ago. That was so eye-opening! As much as we seem to be the same. We’re SO very different. This brings me to the Louise Hay card. 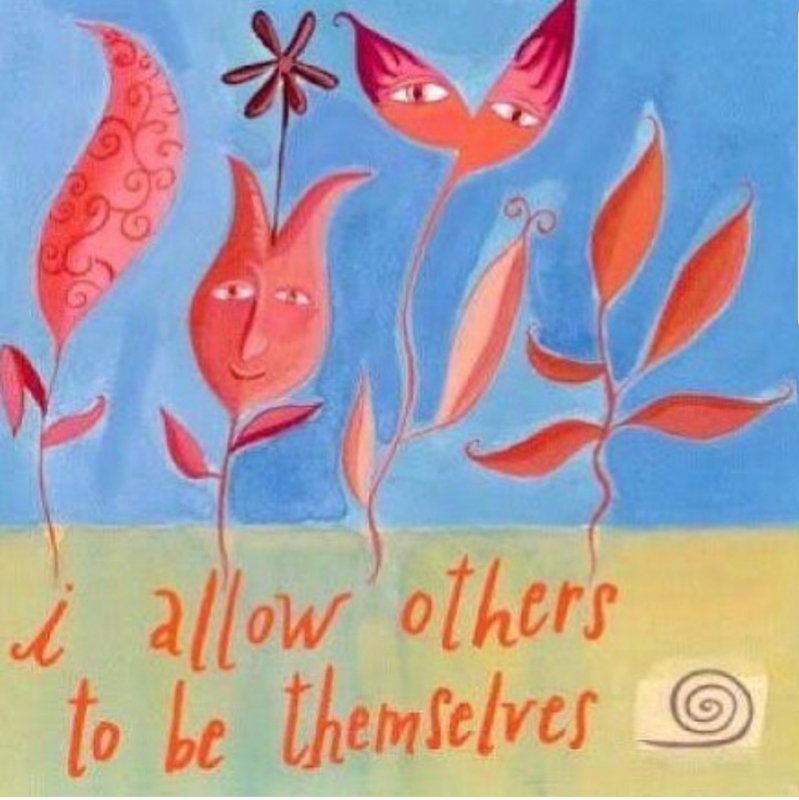 “I allow others to be themselves”. Over the years, without realizing it, I wanted my husband to be different from how he was. Does this sound familiar? I wanted him to do this or do that, because I needed this or that from him. I didn’t consider what he might need from me. I didn’t consider that I was being ridiculously closed-off and selfish. I just knew what I was feeling. Wasn’t that enough? No. If we all believe that our feelings are the right stimulus to how we behave….we need to do better. This can spread to numerous situations. Example…we feel that someone is in a bad mood, so we avoid them. What if that person just lost a loved one, or just got diagnosed with a disease. They need you. Example…we feel that someone is acting out in a selfish manner. We get annoyed at that person, and have a short fuse at him/her. What if that person is socially awkward, or shy, and doesn’t know how to act in social situations? These are just two very simple examples. But, I think you get the point. We can never know what is going on with others. Unless, we engage with them. Unless, we accept them. Unless, we listen to their story or needs. It took some time for me to understand and accept how my husband operates. Yes, we’re so very similar. But I’m an introvert with extrovert tendencies, and he’s an extrovert that has introvert tendencies. It’s interesting to maneuver! This is not the main thing that separates our personalities, but it’s a good start. I had to realize that he’s the way he is and I’m the way I am. Once we recognized that in each other and recognized how we operate in certain situations, everything became easier how we relate to one another. I’m not a relationship expert. I don’t pretend to be. But, this was something that resonated with me and felt should be talked about. It doesn’t only apply to our significant other. It applies to ourselves. How often have you not accepted yourself for how you are? How often have you felt you needed to change yourself? Change can be good. Self-improvement can be good. But, self-acceptance is necessary. Accept yourself where you are at any given moment. If you’re striving to grow and improve….great. If you’re staying the course, because life is complicated….great. But, allow yourself to be where you’re at. Settle in with that for as long as necessary. If we allow others to be themselves, imagine what that can look like. Imagine the possibilities. No judgment of others. No one is judging you. You’re not judging you.